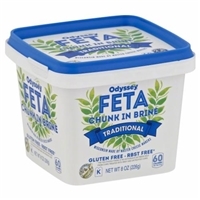 Feta cheese (pasteurized milk, cheese cultures, salt, enzymes), powdered cellulose to prevent caking, natamycin to protect flavor. 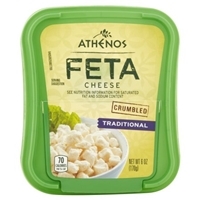 Brand/Manufacturer: Athenos Churny Company, Inc.
Feta cheese (pasteurized part-skim milk, cheese culture, salt, enzymes), powdered cellulose to prevent caking, natamycin (a natural mold inhibitor).contains: milk. 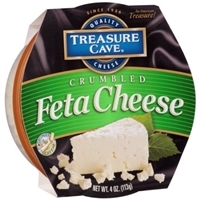 Made from pasteurized milk, salt, cheese culture, enzymes. Gluten free.contains milk. 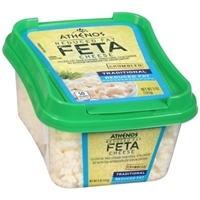 Feta cheese (pasteurized milk, cheese cultures, salt, enzymes), powdered cellulose (to prevent caking), natamycin (to protect flavor).contains: milk. 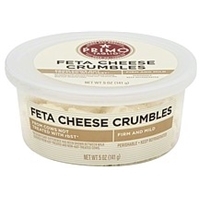 Pasteurized milk, salt, cheese cultures, enzymes.contains: milk. 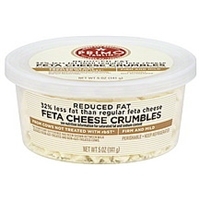 Reduced fat feta cheese (pasteurized part-skim milk, cheese culture, salt, enzymes, vitamin a palmitate), powdered cellulose to prevent caking, natamycin (a natural mold inhibitor).contains: milk. 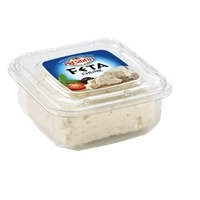 Feta cheese (pasteurized part skim milk, salt, cheese cultures, enzymes), powdered cellulose (to prevent caking), natamycin (to protect flavor).contains: milk. 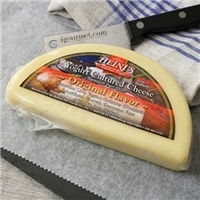 Brand/Manufacturer: Heini's Bunker Hill Cheese Co., Inc.
Pasteurized part skim milk, salt, enzymes, yogurt (skim milk, non-fat dry milk and cultures), yogurt cultures, acidophilus bifidus, casei.